A map in this section identifies the location of the series of public shelters, constructed mainly at the end of the C19th and early C20th all around the Thanet coastline, focussing here only those in the Coastal Park area. Historic maps indicate that there used to be over fifty of these shelters around the Thanet coast, built to encourage exploration and bring health and well-being to visitors and the local population. 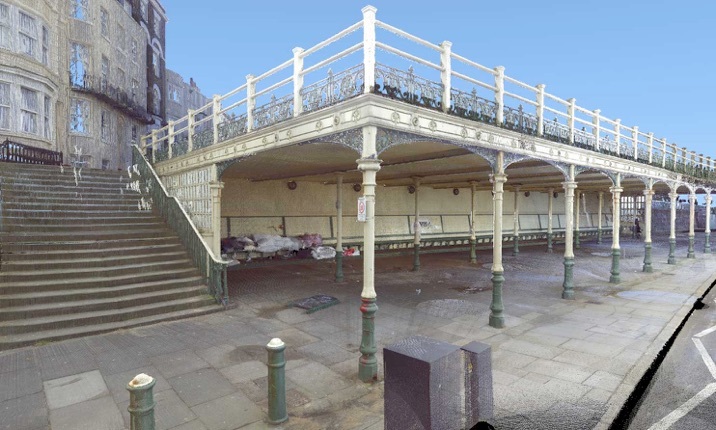 Of the twelve original shelters we have identified from historic maps and photographs within the Margate Coastal Park area, only seven now remain. We note those which exist now in black, numbered from west to east, and those which are missing - in red - from east back to west. The following pages look at the history and current condition of each of the remaining shelters in turn. We have given significant attention to the shelters as many seem to be in imminent danger of collapse, and yet have played such an important part in the development and use of the public space over the last 150 years. The shelters also give poetic articulation to the position between the ‘civilised’ nature of town to the south and the ‘wild’ sea to the north; between the sunrise in the east and the sunset in the west; between sun and shade, rain and dry, wind and calm. The four-sided, pitched roof form of the larger shelters, and the raw ‘elemental’ form of construction recall Abbe Laugier’s ‘Primitive Hut’ described in his 1755 Essay on Architecture, thought to be the ideal ‘base’ form of architecture from which all others emerged. The wide and low form is also reminiscent of the ‘Prarie style’ homes designed in Chicago by American architect Frank Lloyd Wright, at the same time as the Coastal Park shelters were constructed.